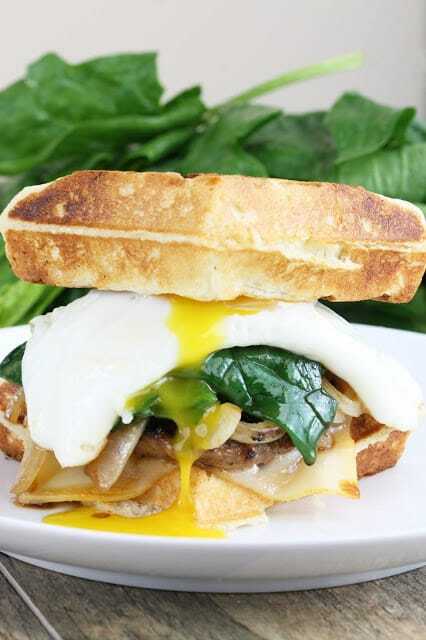 Sometimes you just need to indulge in a fancy breakfast sandwich. 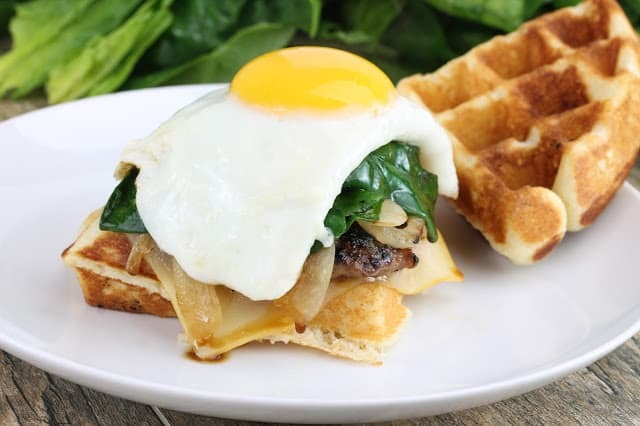 Squeeze some pan fried maple sausage, sauteed onions, some fresh spinach, and a sunny-side up egg in between two waffles and you have yourself a filling, indulgent breakfast sandwich that you can go ahead and drool over as you shove it in your face. This would be great for a special weekend breakfast or brunch. I’ve linked to my recipe for easy waffles and haven’t included waffle making or sausage patty cooking in the instructions. You can always use leftover waffles and sausage or, gulp, pre-cooked. I did make everything pictured from scratch and it took me 30 minutes. If you are using pre-cooked or leftovers it will take you less time, more like 10 to 15 minutes. 1. Heat a heavy skillet over medium high heat. Add in olive oil and onion and saute until onions are soft and translucent, about 5 to 7 minutes. Remove onions from pan and set aside. 2. In the same skillet, add in fresh spinach leaves and cook over medium heat until wilted, 1 to 2 minutes. Set aside. 3. In a clean nonstick skillet, melt butter over medium heat. Crack eggs directly into pan. Cover and reduce heat to medium low. Cook until egg whites are completely solid, 3 to 5 minutes. 4. 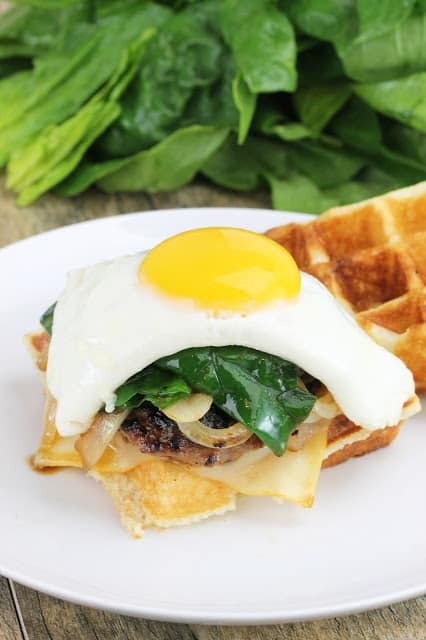 Compile sandwiches by placing 1 slice of cheese on top of a belgian waffle wedge topped with hot sausage patty, a heaping spoonful of onions, a quarter of the spinach, and a sunny side up egg. Top it off with another waffle wedge to complete the sandwich. Repeat to make 4 sandwiches. Serve immediately. Fabulous breakfast–I love the sweet and salty combo!